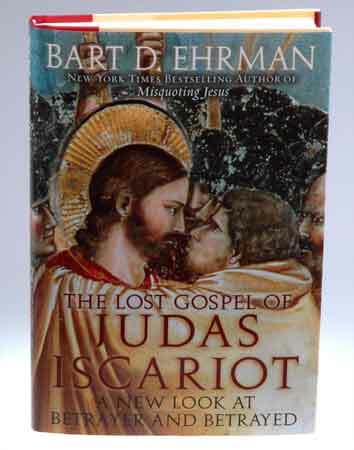 The Lost Gospel of Judas Iscariot: A New Look at Betrayer and Betrayed, by Bart D. Ehrman – This author is one of my favorite writers on early Christianity, and here he looks primarily at this gospel, which was apparently found in Egypt in the late 1970s, and was passed around through the antiquities market for some time before scholars were able to study it. It’s likely the same book that Ireneaus railed against in his writings against heresy. The book doesn’t include the actual text (you can find it here, if you’re interested; it’s quite short), but does summarize it pretty thoroughly. I remember its discovery causing a bit of a stir, as it told the story of Jesus from the point of view of Judas Iscariot, usually the villain of the passion story. So was this an early equivalent of Wicked or The True Story of the Three Little Pigs? Well, sort of. It was a Gnostic Christian text, based on the premise that the material world is the flawed creation of a lesser divine being. Gnosticism predates Christianity, and Ehrman proposes that it was a response to Jewish apocalypticism. The apocalyptic view is that, while evil forces are now in charge of the world, God is ultimately in control and will soon set things right. Jesus himself is generally regarded as an apocalyptic preacher, but since there were elements of his teachings that presented a less worldly and more ideal view than traditional Judaism, Gnostics gladly adopted him as a mouthpiece for their own views. In their belief, Jesus was not the son and representative of the Demiurge worshipped by mainstream Jews, but rather of a higher, non-material god. The Gospel of Judas holds that the supposed betrayer was the only one of Jesus’ disciples who actually understood this, and as such his turning his master over to the authorities to be crucified was actually helping Jesus to escape from his mortal shell and return to the heavenly realm. I’m not sure why Jesus dying any other way wouldn’t have achieved the same result, especially since it was common among Gnostics to believe that the true Jesus didn’t actually have to suffer crucifixion at all. The book also explores what we know about Judas from other sources, which unfortunately isn’t much. The canonical Gospels give different reasons as to why one of Jesus’ closest followers would betray him. If Jesus knew he had to be executed and die, however, then doesn’t that make Judas part of the plan, and hence not as much of a scumbag as it would otherwise appear? While the Gospel of Judas probably isn’t much help in figuring out the historical realities about the man Dante sentenced to being eaten by Satan, it does make clear that, even in the early days of Christianity, there were multiple views on this enigmatic character. This entry was posted in Book Reviews, Christianity, Gnosticism, Historical Personages, History, Religion and tagged bart ehrman, gospel of judas, gospels, jesus, judas iscariot, the lost gospel of judas iscariot. Bookmark the permalink.